The Namibian electricity sector has mainly relied on electricity imports from the Southern African Power Pool (SAPP) over the last decade. However, a growth in electricity demand and scarce import options could cause energy shortages. Therefore, new power plants ought to be commissioned in the near future to avoid the forecasted energy crisis. In this context, Concentrating Solar Power (CSP) generation is regarded as an appropriate alternative to conventional energy technologies, particularly for the excellent solar regime available in Namibia. The study presents a GIS analysis that identifies suitable areas for CSP establishment. A broad range of geographical parameters such as solar radiation, topography, hydrology or land use are examined. The calculations show that the CSP ceiling generation in Namibia is equivalent to 70% of the worldwide electricity production. 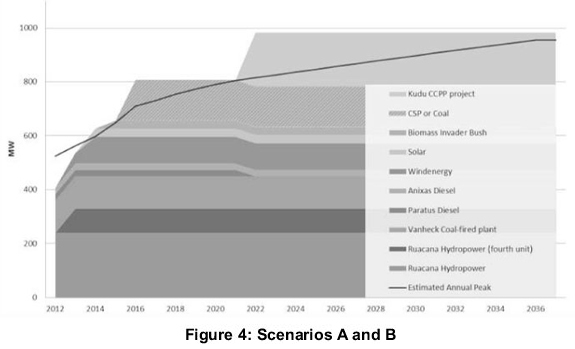 Moreover, the study offers a scenario analysis where concrete CSP alternatives are compared to coal-fired plant projects developed by the national power utility. Meteonorm and System Advisor Model (SAM) are used to design CSP alternatives located in the area offering the best combination between high solar irradiation and short distances to the infrastructures. Despite the affordability concern which has to be addressed with sound financial instruments, CSP represents a seminal opportunity for the energy sector in Namibia. Namibia has 415 MW of installed generation capacity shared among four conventional power plants (Ruacana hydropower station, Van Eck coal-fired plant, Anixas and Paratus diesel plants) (Nampower, 2011a). This power system is ageing, inefficient and insufficient. Consequently, the national power utility, Nampower, relies on imports (e.g. 60% in 2010) from the Southern African Power Pool (SAPP) to secure the electricity supply. However, a growth in electricity demand estimated at 4% and the expiry of the import agreement with Zimbabwe in 2013 will expose Namibia to electricity shortage. Nampower forecasts a power supply deficit of 80 MW by the end of 2012, increasing to 300 MW by 2015. Thus, a revision of the current system as well as new power plant procurements, are necessary. In this context, conventional energy technologies are particularly considered since they are less capital intensive. For example, Nampower is currently studying the feasibility of a new 150 to 300 MW coal-fired power plant in the Erongo Region. However, generation deficit could also be tackled with renewable energy technologies which provide supplementary benefits (e.g. security of supply and sustainability). 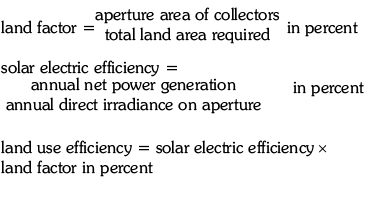 For instance, Concentrating Solar Power is a commercially mature and proven technology (Rainer et al., 2005), adaptable to the load demand curve (Bosatra et al., 2010) and potentially competitive with coal-fired power by 2020 (IEA, 2010a). Moreover, CSP is expected to offer substantial efficiency in Namibia as a result of high solar irradiation (on average, 2 500 kWh/m2/y). The paper evaluates the potential and future of CSP in Namibia. A first section presents a GIS analysis that identifies suitable areas for CSP deployment and estimates the CSP ceiling generation. Subsequently, a second section offers a map- ping of the Levelized Cost of Electricity (LCOE) for a 50 MW CSP plant in order to assess the geographic distribution of CSP economic performances across the country. 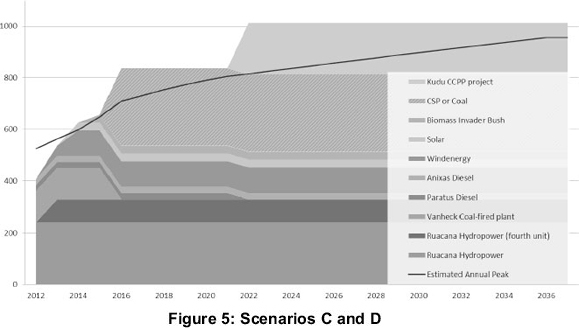 Finally, a third section compares the possible future of CSP and coal power in Namibia through a scenario analysis encompassing economic, social and environmental aspects. This first section of the paper aims to evaluate the technical potential of CSP in Namibia. Geographical parameters either necessary or inappropriate to the construction and/or the operation of a CSP plant are analysed in order to identify suitable areas for CSP deployment. Moreover, the annual electricity potentially generated if all suitable areas were dedicated to CSP (ceiling generation) is calculated. This figure offers an interesting ground of comparison notwithstanding the improbability of such a CSP deployment. The assessment of suitable areas for CSP deployment is an exercise which has been conducted in different regions of the world. 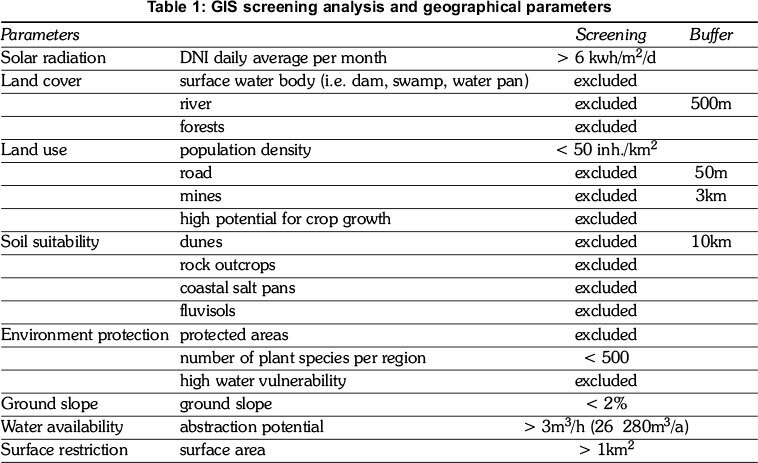 The design of the geographical parameters included here is based on a thorough review of the literature describing similar GIS analysis. For instance, several papers elaborate on CSP prospects in the MENA countries (Broesamle et al., 2001; Trieb, 2005; Ummel et al., 2008). Additionally, Bravo et al (2007) and Fluri (2009) did a spatial analysis respectively of the Spanish and South African territory to determine the associated CSP ceiling generations. The suitable areas account for 13% of the Namibian territory (see Figure 1) and they have a daily DNI average of 7.8 kWh/m2/d, i.e. 2 839 kWh/m2/y. Considering a solar to electricity factor of 12% and a land efficiency factor of 37% (Trieb et al., 2009), the CSP ceiling generation in Namibia reaches 13 885 TWh/y. This represents 3 800 times the total units of electricity sold by Nampower in 2010 including customers, mines and exports. Furthermore, the CSP ceiling generation in Namibia is equivalent to 70% of the world electricity generation (20 055 TWh in 2009, IEA). The ceiling generation in Spain has been estimated at 9 897 TWh/y with a total surface area representing 13.3% of the territory. The analysis of Bravo et al. (2007) is comparatively less conservative since the geographic parameters included are fewer; i.e. ground slope, land cover and DNI. Yet, the ceiling generation in Namibia is 1.4 times greater than in Spain which is one of the leading countries in CSP with 4 456 MW of projects completed or under development (NREL, 2011). The ceiling generation in South Africa equals 1 861.4 TWh/y with a suitable land area of 15 334 km2 (Fluri, 2009). The parameters included are a ground slope limit of 1% as well as an average solar DNI superior to 7.0 kWh/m2/d. Moreover, only areas within a distance of 20 kilometres from the transmission lines were considered suitable. 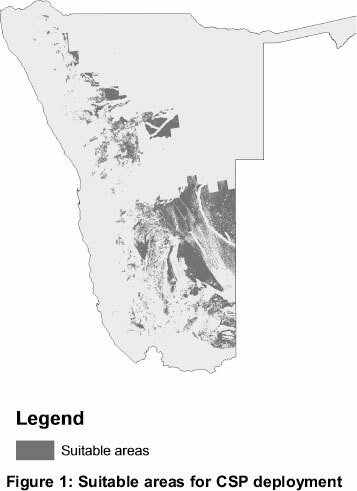 When the former parameter is applied to Namibia, suitable areas represent 6.6% of the territory (i.e. 54 132 km2). The ceiling generation related is 6 823 TWh/y, i.e. 3.6 times superior than in South Africa. Multiple site specific features influence the economic performances of a CSP plant. For instance, the generation output is almost proportional to the amount of solar irradiation collected on the solar field (Yang et al., 2009). Moreover, it is preferable to select a site relatively close to infrastructures such as transmission lines and road in order to limit the construction costs. As it is illustrated in Figure 2, both the infrastructure and solar irradiation are unequally distributed across Namibia.1 Therefore, the second section of this paper evaluates the potential CSP economic performances for the suitable areas previously identified. The repercussions of both solar irradiation and infrastructure accessibility are assessed by mapping the Levelized Cost of Electricity (LCOE) of a 50 MW CSP parabolic trough plant. The definition of the LCOE applied in the paper is in line with the NREL and IPCC's recommendations (Short et al., 2005; IPCC, 2011). Although the LCOE is usually used to compare different energy technologies, it is selected here as the relevant indicator to rank suitable areas. The expenses included are the initial investment, the operation and maintenance as well as the infrastructure costs (i.e. transmission line, connection and road construction). The energy output per year is calculated according to the plant design and available solar irradiation. 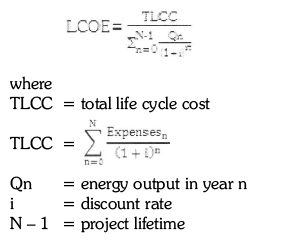 Economic data strictly related to the CSP plant and included in the calculation rely on NREL reference plant for cost modelling (Turchi, 2010). Nevertheless, Namibian specific data were preferred and used when available. The labour costs included in the operation and maintenance were adapted from the distribution of wages find in the Namibian electricity, gas and water sector (MLSW, 2002). Moreover, transmission lines construction and connection costs are Namibian specific to be communicated by the national power utility2 (Fourier, pers. communication, 2011). Finally, the road construction cost estimation is based on local projects (e.g. Gobabis to Grootfontein road project) (Pienaar, 2008). The calculations show that according to the area localization the LCOE range from 17.4 to 22.5 US¢/kWh when the infrastructures costs are included. Similarly, they range from 16.9 to 19.5 US¢/kWh when the infrastructure costs are excluded. A comparison with the LCOE averages available in the literature offers an interesting perspec- tive. The IPCC special report on renewable energy resources (2011) gives LCOE within a range of 16 to 25 US¢/kWh for a CSP plant installed with 6 hours of storage (discount rate: 7%). Additionally, in the Ecostar Road map an LCOE of 22.3 USC/kWh (17.3 €¢/kWh) is estimated for a parabolic CSP plant installed with 3 hours of storage in Spain (Pitz-Paal et al., 2005). 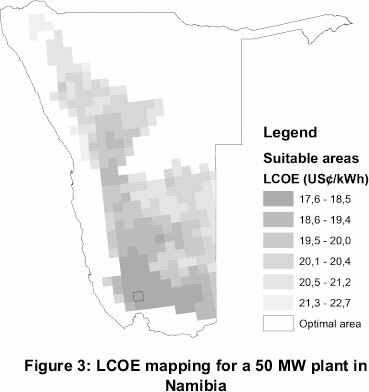 Although, CSP prices are very volatile and depend on local conditions, the LCOE found in Namibia is rather low due to the high solar irradiation available. Furthermore, the plant considered here is equipped with a dry cooling system which is the most expensive cooling technology. Given that certain areas in Namibia could provide enough water to utilize a wet cooling system, the LCOE achievable could drop to 14.5 US¢/kWh (excluding infrastructures). The prerequisite is that areas with the maximum solar irradiation would match high water abstraction potential. The first two sections of the paper offer the necessary information to investigate the potential for CSP to challenge effectively conventional energy technologies in the Namibian context. Nampower, is currently studying two coal projects; i.e. the rehabilitation of the Van Eck 120 MW coal-fired plant and the construction of a new 150 to 300 MW plant in Erongo Region (Nampower, 2011a). The rehabilitation study was launched in August 2011 and funded by US Trade and Development Agency (USTDA). In 2011, the Van Eck coal-fired plant was only used as a peaker due to its general inefficiency (operational capacity of 55 MW instead of 120 MW) and high operating costs. Its rehabilitation aims at regaining regular generation performance (e.g. capacity factor: 75%). On the other hand, the environmental impact assessment of the Erongo project is already completed and a possible com- missioning is planned in 2018. This section aims at examining the feasibility of switching from these projects to concentrating solar power. Different scenarios suiting with the supply sector were built (Le Fol, 2012) and the CSP plants were considered to be established in the optimal area identified in the previous section. The meteorological data of this specific area were obtained via Meteonorm. Moreover, the CSP performances and the impact of different thermal energy storage (TES) capacity were computed through the System Advisor Model (SAM). Additionally, multiple indicators3 (e.g. health and climate change external costs, job creation) were set up in order to enlarge the scope of analysis and to include environmental and social aspects. The operation and maintenance and fuel costs (159 US$/t -1297 N$/t) were defined according to Nampower's data (Nampower, 2011a; ECB, 2001). 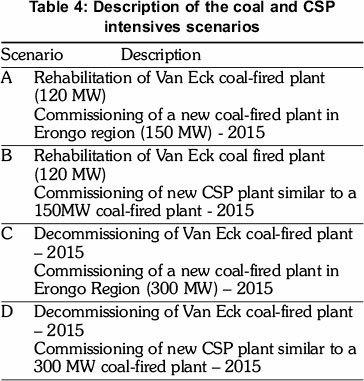 Moreover, the specific rehabilitation costs were estimated according to available data on four other Southern African coal-fired plant rehabilitation projects (SADC, 2008). The same methodology has been used to design the 150 MW and 300 MW new coal-fired plants. Nevertheless, the specific investment cost were defined according to the South African average (2 104 US$/kWe) available in the IEA report on Projected Cost of Generating Electricity (IEA, 2010b). The CSP plants were considered to be located in the optimal area identified in the previous section. Thus, accurate meteorological data was collected for this specific location via Meteornorm. This software provided data from three meteorological stations (Keetmanshoop, Alexander Bay, Upington) to retrieve the Typical Meteorological Year (TMY) of the optimal area. Furthermore, the given TMY was integrated in SAM in order to design the CSP alternatives which supply the same amount of electricity per year with coal-fired reference plants. Different variations on the CSP components were analysed (e.g. solar multiple, storage capacity, nameplate capacity) to identify the most appropriate alternatives. The economic data strictly related to the investment costs are based on the NREL reference plant for cost modelling and Namibian specific data on wages were included in operation and maintenances costs (Turchi, 2010; MLSW, 2002). The analysis results in four different designs which, technically speaking, challenge coal-fired genera- tion (see Figure 6). The solar multiple and the storage capacity increases enable to reduce the name-plate capacity and to improve the capacity factor of the CSP plant whilst an even generation output is supplied. However, the seasonal variations in solar radiations cause output fluctuations for CSP plant whereas, the coal generation is assumed stable over time. This difference has to be put into perspective according to the seasonal electricity demand which is higher during summer time in Namibia when CSP plants are likely to produce more electricity. 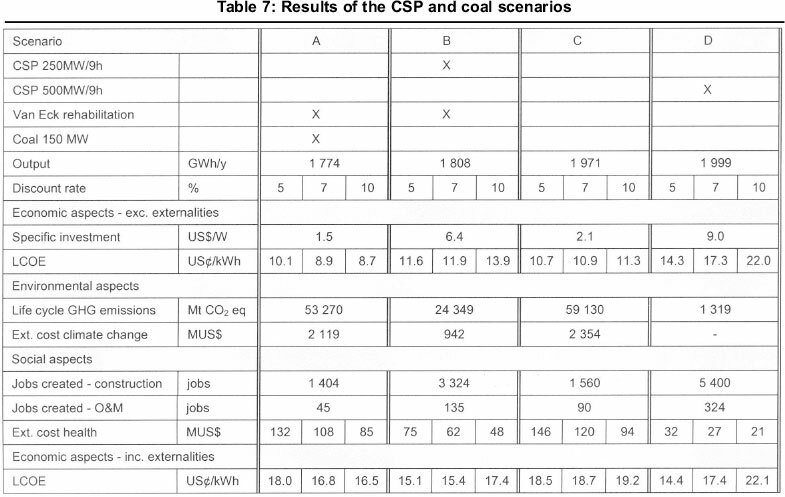 The analysis4 demonstrates that coal intensive scenarios are generally more affordable due to lower investment costs (see Table 7). Their LCOE varies between 8.7 to 11.3 US¢/kWh while LCOE related to CSP intensive scenarios are within a range of 10.7 to 22.0 US¢/kWh. The low cost of coal power is a strong advantage since affordable electricity is required in a country having an electrification rate of 34% (IEA, 2011). On the other hand, CSP intensive scenarios create more jobs (e.g. scenario C: 90 jobs, scenario D: 324 jobs) which is considerably beneficial in Namibia where the unemployment rate reaches 51.2% (MLSW, 2008). Moreover, the external costs of coal intensive scenarios are substantial due to more damaging impacts on health and environment. For example, a 300 MW coal-fired plant would emit 59 130 Mt of CO2eq during its lifetime while a 500 MW CSP plant 1 319 Mt of CO2eq. Consequently, the LCOE of CSP intensive scenarios are even lower than LCOE of coal intensive scenarios when including external costs. The CSP technology presents numerous advantages with regard to the Namibian electricity sector context. First of all, the massive solar and land resources would ensure the security of supply while conventional energy technologies, such as coal power, are primarily sensitive to the fuel price volatility. Moreover, the CSP technology would respond to the difficulties met by the supply sector in terms of base load deficit and grid stability. Additionally, the job created during the CSP construction and operation phases are comparatively high and the emergence of a new industrial sector based on a successful technology transfer would strengthen the Namibian economy. Furthermore, the impacts of CSP on health and environment are negligible. Conversely, a 300 MW coal-fired plant, for instance, would involve health external cost of US$ 120 million over its lifetime and would change the Namibia's international rank with respect to CO2 emissions from 126th to 114th. However, the economic competitiveness of CSP compared with conventional energy technologies remains a challenge. Therefore, further research on drivers that would improve CSP economic performances have to be conducted. Sound financial schemes such as Clean Development Mechanism (CDM) and foreign or national economic supports (e.g. targeted tax breaks, Green Climate Fund) could bridge the gap between CSP and conventional energy costs. Finally, hybrid technologies combining CSP and other energy resources existing in Namibia (e.g. biomass and gas) are options which have to be examined. 1. 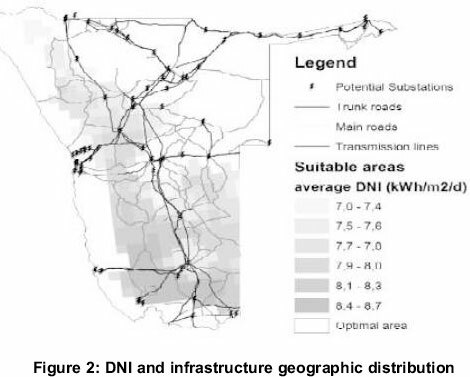 The road network and electrical grid GIS dataset were respectively provided by the Road Authority of Namibia and Nampower (Road Authority, 2011; Nampower, 2011b). 2. Construction of transmission lines, construction and connection costs included in this study are generic and they do not constitute any commitment from Nampower. 3. The indicators included were defined according to the literature. CSP and Coal plants external cost on environment (neglected for CSP) and life cycle GHG emissions: Burkhardt et al., 2011; IPCC, 2011. CSP and Coal plants external cost on health: IPCC, 2011. Coal and CSP job creation: Rutovitz, 2010. 4. 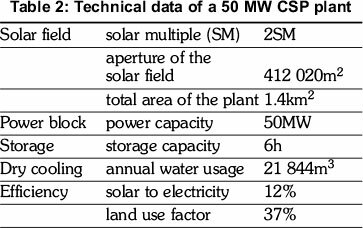 The CSP options with 9 hours of storage and a solar multiple of 2.5 were selected for the economic analysis, particularly because their capacity factors (46%) is closer to those of coal plants (75%) and their characteristics would respond better to the Namibian supply sector issues (e.g. need for base load). The authors particularly wish to thank Dr. Frede Helplund (Aalborg University), Dr. Franz Trieb (DLR) and Mr. Kudakwashe Ndhlukula (REEEI - also as co-author) for providing their guidance. The support offered by the land management division of Polytechnic of Namibia has largely contributed to the achievement of this study. They would like to thank Mr. Sebastian Mukumbira, Mr. Kaleb G. Negussie and Dr. Daniel Wyss.